New Delhi : After a weeks of India biggest auction, in which the 700 MHz spectrum went unsold, Bharat Sanchar Nigam Limited (BSNL) which is 100 per cent Government of India Public Sector, has approached the Telecom Department for airwaves in the premium band for rolling out 4G services. The telecom PSU has suggested that a 5 MHz block in the 700 Mhz band be assigned to it by the government through the equity route. BSNL CMD Anupam Shrivastava said that, "Yes. We have written to the Department of Telecom seeking 5 MHz block on 700 MHz band through equity route". In the recently concluded spectrum auction, the debt-ridden telecom sector had ignored premium radio-waves in 700 MHz band — which was put up for sale for the first time — at a reserve or base price of Rs 11,485 crore per MHz. Industry bodies like GSMA have urged Indian Government to reconsider the pricing for 700 MHz band, which failed to find buyers due to its "unrealistically" high pricing. But Shrivastava downplayed the concerns on pricing, saying that spectrum in the 700 MHz band would be an asset for the corporation, given its plans for 4G services. "We do not have right kind of 4G spectrum which can give us coverage, although we have some 4G spectrum which can give us the capacity. But 700 MHz, if it comes, in combination with 2500 MHz band available with us, will put us in a position to roll out 4G services through spectrum route across the country," he said. He also said that 700 MHz offered clear advantage such as "good coverage" with lesser number of base stations. "The 700 MHz spectrum can penetrate homes, so that means improved indoor coverage," he said. 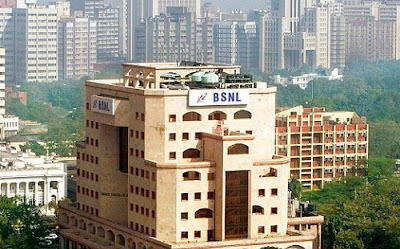 Explaining the model being proposed by BSNL, he said that the spectrum could be assigned, in lieu of Government raising its equity in the corporation. Shrivastava also pointed out that, "We are proposing that 700 MHz spectrum comes to us and in lieu of that, the paid-up equity of the government can increase to that extent in BSNL."